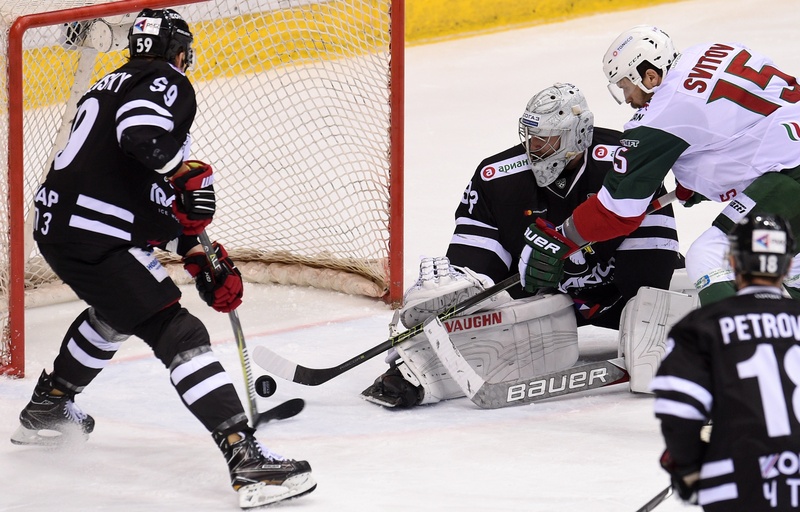 Vasily Tokranov’s overtime goal earned Ak Bars a tight victory in Chelyabinsk – and put the team into a commanding 3-0 lead in the Eastern Conference Final. Tokranov, his team’s most productive defenseman throughout these playoffs, struck in the 64th minute to win the game seconds after Traktor managed to kill a penalty. The home team was unable to clear its lines, and the puck found its way back to Tokranov for a centre point shot that ripped past Pavel Francouz in the Chelyabinsk net. Anton Lander threw up the screen on the Czech goalie, but complaints from the home bench were waved away after a video review. For Traktor, meanwhile, it was another case of running the opposition close but failing to find a way to win. All three games in the series have been decided by a single goal and tonight was the first time that Anvar Gatiyatulin’s team had never held a lead in the game. In game three, Ak Bars made a flying start. Traktor faced two penalties inside the first five minutes, and the visitor came close to converting both chances. First, Danis Zaripov tested Francouz. Next, Rob Klinkhammer’s efforts on the slot forced another big save out of the Czech, and there were more nervous moments as Alexander Svitov got a dangerous deflection on an Andrei Markov shot. Traktor managed to kill those two penalties and get itself into the game, but struggled to create good chances in front of Emil Garipov’s net. Even after two power play chances of its own, the home team managed just two shots on target in the opening frame while Francouz made 15 saves to keep the scoresheet blank. Ak Bars got in front early in the second period when its power play clicked to convert an opportunity within just 10 seconds. Vladimir Tkachyov fed the puck across the face of the net to Zaripov; Zaripov’s shot was blocked, but Svitov was right there on the spot to stuff home the rebound at the third attempt. But the visitor no longer had the same level of dominance, and Traktor was creating chances of its own. The reward came 17 seconds before the second intermission when Ivan Vishnevsky tied the scores. The goal came on a breakaway, with Yury Petrov’s pass springing Alexander Chernikov into the danger zone. Chernikov’s feed to the point invited Vishnevsky to shoot, and the D-man’s effort flew past Garipov to level the scores. The third period produced no further goals: Ak Bars started more brightly, but Traktor rallied and created a couple of chances late in the frame for Linus Videll and Nick Bailen. Neither side could force a winner, though, and the action went into overtime. In the extras, an early power play for Ak Bars set the tone. Tkachyov hit the post as the visitor piled on the pressure. Danil Gubarev returned from the box, but just three seconds later Tokranov got his winner. Traktor must win Thursday’s meeting here in Chelyabinsk to remain in the competition. Even if it can manage that, the odds are heavily stacked against it: only once in KHL history has a team recovered from 0-3 in a playoff series.